Located 1 hour south west of Van Horn Texas in northern Presidio county this ranch has it all. High desert hills, larger arroyos, small chalk hills, and even Rio Grande river frontage. There are a few natural springs located throughout the ranch drawing in and holding wildlife. This property is 15,000 acres where both self guided and guided hunts will be offered on a limited basis. On a Texas map you can look at Valentine Texas and draw a line straight west until you hit the Rio Grande then go a little north and that is roughly the center of the ranch. A fair amount of Aoudad and Mule deer are on the ranch along with a healthy population of Javelina, Quail, and of course Predators. Rams upwards of 33" and mule deer in the 140" to 160"range have regularly been harvested off this property. A growing population of Hogs inhabit the river area and offer a challenging hunt along the thick brush near the river. There is also some great cat fishing in the river (when it has water) nearby to camp and who knows you may even see an Elk or Oryx passing through. The west side of the ranch contains a fair road system although a high clearance vehicle with good tires is a must, 4x4 is highly recommended with a Jeep being best to get into the most remote areas. The east side of the ranch is primitive with the only roads being 2 tracks up washes/drainage's and steeper hills. A good pair of walking boots, a jeep, or even a horse is your best means of transportation. Self guided hunters need to bring a chainsaw to cut down some wood for the fire pit, and always leave more than you use. Hunters can fly into El Paso and rent a vehicle, meet us in Van Horn, or airport pick up is available for a small fee. The ranch is an easy 3 hour drive from El Paso international airport. Dirt roads into the ranch are usually rough. We will offer guided, semi guided, and self guided hunts on this ranch. The ranch is available to lease for mule deer rifle season for a medium sized group. Only mature animals may be harvested and the deer population is on the rebound so this is a true trophy lease and not a "shooters" lease. Driving and long distance glassing will be done to locate animals along with a combination of hiking, hunting over or near corn/protein feeders and near water. Please respect the ranch including the campsite leaving it better than you found it. We are able to offer self guided hunts for that very reason. Hunters must be in good physical condition or be very patient and watch trails or hunt near feed. Shots upwards of 400 plus yards can be expected on larger game. We will free choice feed year round and have several watering areas in place. A simple one room cabin with water and electricity is where we will lay our head on guided hunts. A brand new shower house was also just added in June 2013 to make your stay more comfortable while in this remote area. Camp is simple, clean, and gets the job done while offering a truly rustic experience. We are constantly trying to improve camp so stay tuned! Self guided hunters will have access to the campsite which has running water, lights, fire pit, simple skinning rack, and a small covered area. You must haul out your own trash and use your own firewood please! Hunts on this ranch are very affordable/economical and we can accommodate larger groups for Javelina hunts. Please leave the camp clean and treat it as your own! Van Horn Ranch Photos Click Here! This property is not new to WTHO but rather one of our first ranches we ever hunted. We rested the ranch for several years to bring up the quality of hunting to what we expected for this area. There is year round feeding in place and water guzzlers throughout the ranch. A large road system allows for both safari style hunting and hiking. There is a healthy Mule Deer, Aoudad, and Javelina population on the ranch. Quail numbers are decent with a few hunts offered for them each season as well. The ranch is located just under 1 hour east of El Paso and airport pick up can be added to your hunt if flying into El Paso International. Terrain on the ranch is primarily mountainous with some flat land near headquarters. Only a handful of Trophy & Management Mule deer hunts are offered to the public each year. Please feel free to call me directly for more specifics on this ranch. References can be found under the Booking/Contact us Page for this property. We have connected on a very well known ranch in the heart of Big Bend country in far southwest Texas. This property borders Big Bend State park and is just outside the town of Terlingua. The terrain is very rugged and all hunters must be in good physical shape for any hunts here. Nearest airports are 4 to 5 hours away in El Paso or Midland, this is a remote area. Our base hunt packages will not include lodging or meals although there are many options in the immediate area. Chef prepared meals and resort lodging can be arranged. There is a very healthy Aoudad population on the ranch and we are currently working on managing the mule deer herd. Javelina are plentiful along the river bottoms and along the Golf Course. On occasion there are Elk on the property which can be added on as a Trophy fee basis. A couple of Fall and Winter Aoudad hunts are offered and only 2 to 3 Mule deer hunts. Please call me for more information on the specifics of this ranch. References are available and pictures please just ask. Located just south of Ozona or Sonora Texas Val Verde county is known for big Trophy Aoudad just as Presidio county is. Val Verde county also offers great Trophy Whitetail, Turkey, and Exotic hunting. Rancho Consuelo offers a good road system, many protein feeders that Aoudad and Whitetail frequent and comfortable simple on site lodging with satellite TV and WiFi. There is even an ice machine to keep your ice chests topped off for cold beverages or to keep your meat cool. We will hunt this ranch from September through early March each year for Aoudad and Whitetail during the regular general season. Whitetail hunting on this ranch (Consuelo) has just been opened to the public with a limited number of hunts for the 2013 Season! A combo hunt is a possibility if available. Terrain on the ranch varies from deep canyons, big valley floors, and small mesas which is an Aoudad and Deer paradise. Plant life consists of varying Cacti, Cedar, Oaks, Mesquite and Grass. The floor is very rocky and most of it is loose, a good walking stick will do you some good out here. Most hunts will be group style hunts with 2 to 5 hunters in camp. This means dates will be specific each year unless you have a small group established to book. Group style hunts still offer very high success rates (nearly 100%) and the ranch is large enough to support a group of up to 5 hunters easily. Rancho Consuelo totals over 8,000 acres and with all the big canyons, hills, and valleys it hunts like a ranch twice its size! If you are wanting to get a Big Aoudad Ram with a Bow or Cross Bow this is the ranch to do it on. Aoudad frequent the many protein feeders on the ranch and we will set up Pop Up blinds or Tripod stands to hunt out of. You are more than welcome to try a Spot and Stalk Hunt as well but its going to be tough. Rifle hunts will consist of Hiking, Driving and Glassing and hunting Feed or watering stations. The Brush and Cactus on the ranch make for good stalking conditions although they also make it hard to spot the Aoudad at times. A good pair of Bino's and or Spotting Scope is a must on this ranch. 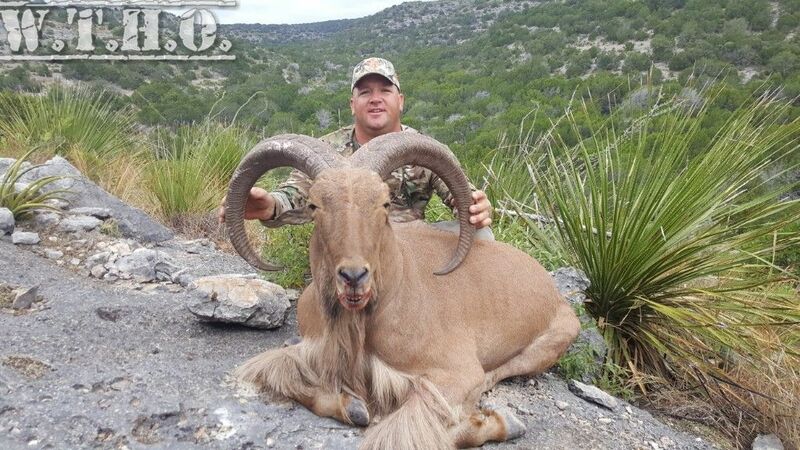 The Aoudad population on the ranch is High and a Trophy Ram in the 28" to 32" range is what is typically harvested. Rams upwards of 35 inches have been taken here almost every year. Mature Whitetail average 140" to 150" plus inches. The ranch is located right outside Juno Texas (small dot on a Texas map) about 45 minutes to Ozona. Rancho Consuelo is a great choice for the hunter wanting to hike or sit in a stand. We will only offer Guided or 2x1 Guided hunts on this ranch. Hunters can fly into Del Rio and rent a vehicle or you can meet us near the ranch. From Del Rio you can expect anywhere from a 1 hour to 1.5 hour drive to the ranch. Airport pick up is available for a small fee. You can also fly into San Angelo which is roughly 2 hours from the ranch. We do have a Taxidermist available in Sonora who can pick up your Trophy from the ranch directly if you so choose to do. I also have multiple ranches on the Devils River which are a short drive from the Rancho Consuelo that also offer great Aoudad hunting opportunities. Please inquire for the latest ranches and specifics on each one. Consuelo and Devils River Photos Click Here! Guided Aoudad Hudspeth River R.